[miau] The land of Lemuria has been long hinted as to be lying underneath the Pacific and Indian oceans. This hypothetical story takes on a mythical feel as soon as you look and the background to the game. The misty trees, waterfalls, and moving ships, all add to the allure of the Land of Lemuria Slot game. The creators at Genesis Gaming have really taken things to a new level with this game, providing players some of the most exciting bonus rounds in recent years. You have a chance to hit a huge jackpot and load up your bankroll with riches beyond your wildest dreams. You can bet up to 20 coins, with a max bet of $125 in Land of Lemuria, will all lines coming into play. The symbols that make up the game are mysterious to say the least. Starting with the Ace, King, Queen, Jack, Ten, and Nine symbols, these pay out the least amount of winnings. The next rewarding symbol is the lotus blossoms, followed by the mysterious crystal skulls. The top paying symbol is the kryptonite minerals, paying 1000 coins for 5 in a row. 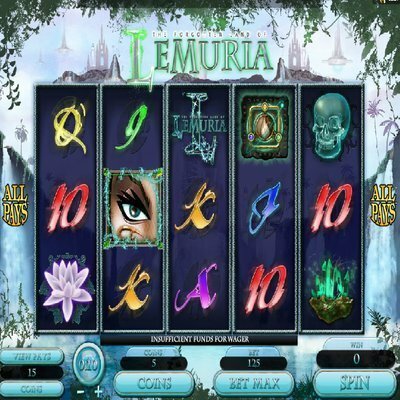 The Forgotten Land of Lemuria Logo is the wild symbol for this slot game, and it will substitute for any other symbol in a payline. The deadly stare of the green-eyed witch is the scatter symbol, and getting 3 or more of the scatters will transport you to 3 different worlds where your fortunes await you. It is in the bonus games where the fun and excitement of Land of Lemuria begins and ends. The bonus game in the Forgotten Land of Lemuria is actually divided into three different unique and exciting games. As soon as you get the scatters on the screen, you are brought to a second screen where the witch is seen levitating in front of you. The witch tempts you to begin the game by choosing one of the 10 floating orbs. There are three different vaults, the Water, Earth, and Fire vaults. You begin play in the Water vault, moving respectively to the Earth and finally Fire vault. Once inside a vault, you have the opportunity to choose from 10 different orbs. Each of the orbs has a prize in it. The prizes range from different coin amounts to a pass to the next vault. If the orb is empty, the bonus round comes to a screeching halt. In the bonus round you can continue moving through the vaults and growing your bankroll, as long as you keep choosing those coins. It really has some incredible graphics, keeping you involved and entertained at the same time. Be sure when you first begin playing that you choose the max play option. This will ensure that you win the highest possible amount of money each spin. The coin denominations range from a penny to fifty cents, allowing you to adjust those settings each spin. The max bet each spin is 250 coins, then you simply press the spin button and let the adventure begin.Your journey to The Forgotten Land of Lemuria could net you a top prize of $7,500 if you are able to defeat the evil witch and have luck on your side. The game plays very fast and the images are exactly what you would expect from a city that is hidden deep below the ocean.